Please click HERE to see and copy the Required Template! and we will send you the template! From September 2010 we have also offered our Students the opportunity to enrol with us for Casting Agencies if they wish and FREE of charge. Our Students will be put forward to Major Casting agencies to be considered for Film and TV work and Modelling. Happy Days test launched the agency in June 2010 and succeeded in having 12 Students placed in a new Irish film, “Pentecost”. Read all about what our students and parents have been up to below. With directors, producers and fellow actors complementing our students on their talent, professionalism and great sense of fun. If you would like to become involved with our Casting Agencies, it is very simple. When you join our classes you just fill in our Casting Agency form and submit by email two photographs – one head shot and one full length shot. Many agencies have specific requirements. To show your child off to the best possible advantage we hope to offer the opportunity to have their photographs taken to the Agencies requirements, at a minimum charge in the new term. There is no need to get expensive head shots taken in a studio. We stress that involvement with our casting agencies is optional. We do not want to give our Students unrealistic expectations. We want them to enjoy the experience and have fun. The Casting Agency is not the focus of our classes but it is a NEW and exciting feature we offer. Newsflash! 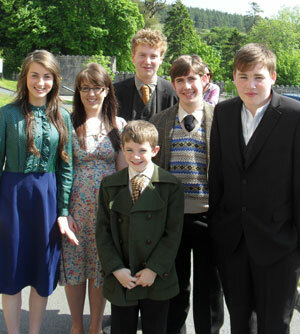 Trailer for the new Irish Film "Pentecost" featuring many of our students is now available to view on Youtube! Just click here to view! Also we would like to congratulate Hana Kelly for her performance as "Little Ellie" in "Three wise Women" staring as the young version of Amy Huberman who plays the adult character "Ellie"! See our Gallery Section for Photos! Just Click here to see our production photos! Congratulations to all our students, (and parents!) who have appeared in "The Cabin", well done and a great time was had by all. Just Click here to see our production photos! A Big Well done to Beth, Megan and Caoimhe out froming on Damo and Ivor! Gourmets Guide to Love ! We have hear a whisper that followning her outstanding performance we well may see Hana again on the Beo show. So don't forget to keep watching ! Congratulations to Hanna in the latest Lidl Ad! set the tone for an exciting launch and fun filled day. Well done to all those Happy Days Students who were involved!! A wonderful night and sudden adult death syndrome is such a worthy cause. A Big Thank You to all the Happy Days Crew who came to support! The director complemented you on your wonderful professional performances and attitude! had been nominated for an Oscar! which featured 12 students, Sophie Byrne Carter, Emily Charles, Andrew Clayton, Matthew Donoghue, Ella O' Neill, Claire Farley, Gillian Kenny, Piers Ryan, Conor Ryan, Aaron Nester, Caoimhe O' Connell and Aoibheen O' Connell. Happy Days School of Performing Arts! and all those who were involved in its filming last summer. To watch Aisling again click here! To view a trailer for Titanic Please Click Here! A big round of applause to those students who were involved in the making of the Happy Days School of Performing Arts music video recently! It was great fun and the songs sounded wonderful ! Well Done! To view a trailer for the film staring Hana please Click Here! The much anticipated movie "The Cabin" has just premiered in America and will be shortly on our shores! This movie featured many of our students Gillian Kenny, Conor Delaney, Derbhla Walsh, Mathew Bofin, Clarie Mugabo, Victoria Keogh, Anna Fay, Claire Hennessy, Christine Mc Mahon & Alison Young (to name but a few). Oh! And just for a change, some willing Mammys and Daddys also appeared. Congratulations also to Charlotte Owens and Sean Ryan for the Students Rights Film. Well done also to Luca Crone, Emma Moyninhan, Ciara Ivie and Lucy Phibbs for the performance in the AA film! with Hollywood's own Lea Thompson of "Back to the Future" fame! Also congratulations to all those currently involved in filming at the moment .